A lesser, darker mutation of “The Departed” fails to inspire. “Black Mass” isn’t sure what it wants to be and that uncertainty hurts the film, repeatedly eschewing the more interesting arcs and characters on a whim. Instead of narrative consistency, the film clamps down on a tone – being a “very dark, very serious” film that begs for awards-season attention. Attention it will certainly get thanks to the film’s highlight: Johnny Depp’s performance as rising Irish mobster James “Whitey” Bulger. 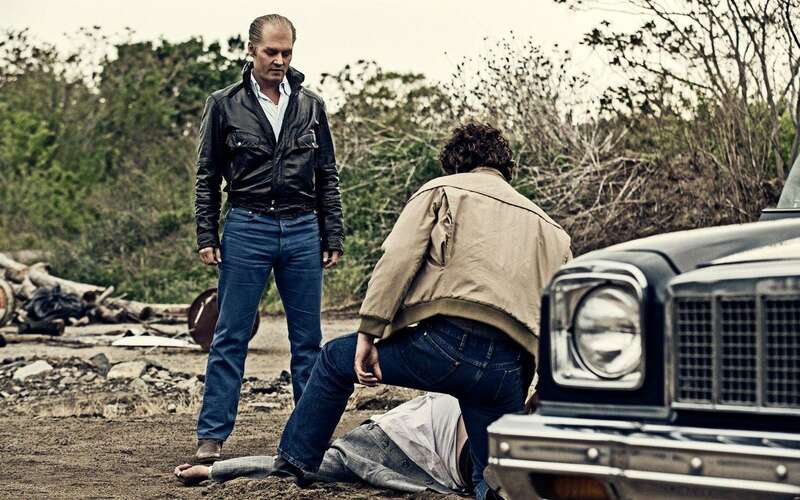 The amount of focus given to Depp in promotional material is a bit misleading, as “Black Mass” largely tries to be about the less-than-professional relationship between Whitey and John Connolly — a schoolyard friend who’s since graduated into the FBI — which wouldn’t be as dispiriting if the material with Connolly weren’t as weak as it was. The sense of urgency and gravitas that Depp brings to each scene keeps the audience asking for more while we slog through half-assed jokes that wouldn’t make it past the first draft of a Scorsese film. There’s no emotional core in the film and early attempts, such as the hospitalization of Bulger’s son, play as dishonest attempts at conjuring empathy. We’re run through much too quickly and whatever emotional sincerity it is meant to portray is lost to the ether. The brutal realism with which the film portrays violence is mesmerizing, especially because the film is able to believably translate those violent actions across all characters — not just Depp. “Black Mass” doesn’t say anything new, but it does execute the basics of a film (outside of odd pacing) with some finesse. Visually, the film’s a winner due to the combined forces of director Scott Cooper and DP Masanobu Takayanagi (“Silver Linings Playbook,” “Warrior”). Cooper’s technical skill as a director is great, with an impressive eye for the city’s environment. Blues and browns dominate the screen, bringing the dreary Boston buildings into focus. The intimate shots of the character’s solemn faces become calling cards for the film, working particularly well in a high-stakes dinner scene that places the viewer in a disturbingly close position. The use of simple but beautiful overhead shots and particularly smart locations stamp some of the film’s best shots into mind. Yet “Black Mass” fails to say anything of substance – which wouldn’t be a fault if it weren’t constantly striving for a goal it isn’t sure of. It could have touched upon the larger issues of the federal government working with criminals for what’s perceived to be a greater cause, but brushes it off and lightly dumps the story thread onto Connolly, whose storyline continues to fumble forward. We’re buried in the entertainment graveyard of filmic ‘80s bureaucracy with the asides from Adam Scott and Kevin Bacon’s ancillary characters keeping us from falling asleep. Instead of dealing with the fallout from a few major events, the film pressed forth and leaves those issues in the dust. “Black Mass” doesn’t exceed or fail, but passes with a slight swagger. The film comes close to becoming a chore with how repetitive it gets, but the all-star cast keeps the momentum on life support. Benedict Cumberbatch and Julianne Nicholson are woefully underused in their roles, but take command of the screen and lend the presence usually missing when Whitey is out of the frame. The film seems to be less interested in Bulger himself than his effect on the people surrounding him, but the audience is never given a chance to care about the others beyond the perfunctory. “Black Mass” is a middling attempt at grandeur, passing through decades and characters when it would have been better served by a tighter focus on Bulger and his crew. What’s a family for if you don’t spend time with them?